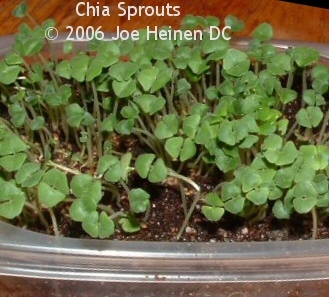 Chia sprouts are packed with nutrition. They are high in fiber, high in calcium and high in omega 3's. 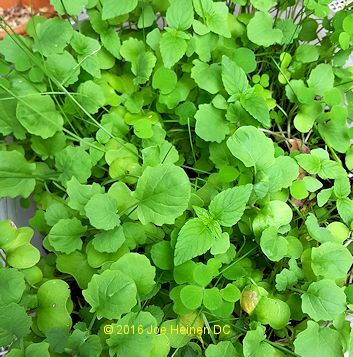 They are one of the few plants that have all the essential amino acids (the building blocks of protein). This is one of the most mucilaginous seeds of all. Do NOT soak it unless growing on a chia pet! Grow these on soil, on a burlap bag, or on virtually any moisture retaining medium (as minimal as paper towel or fabric - like cheesecloth) you can think of. I use the coconut coir/sand mix in a shallow tray with drain holes. Thoroughly moisten that upon which you are going to grow. If using a burlap bag or a small bit of baby blanket or similar medium - lay it on a plate or in a pan or something so that you don't end up watering your counter. Likewise, if using a tray, put it on a plate or in a solid tray to capture water runoff. If planting on soil in a tray use another tray - up side down. the first 2-3 days. It is not always necessary when growing to cover them at all. Experiment for yourself and see what works best in your climate/location. Place your chia garden in a low-light, room temperature location (70° is optimal). Keep the medium moist - but not soggy - by watering or misting every day or two. When your plants grow up and begin to shed their hulls they are ready for light so move them (if necessary) to a well lighted location. If you go with sunlight be prepared to water more frequently. Room light will usually do quite nicely as well and will not dry out your medium as quickly. Keep the medium moist but not soggy by watering regularly. Water from the side if possible to prevent injuring the tiny plants. When your plants have open leaves and are green, they are done. Harvest by cutting just above the medium upon which they have grown. During the final 8-12 hours minimize the surface moisture of your plants - they will store best in your refrigerator if they are dry to the touch. So if you water try to keep the water off the plants - just water the medium. 1-2 Tablespoons for a 5" tray. 1/3-1/2 Cup for an 11 inch x 11 inch square tray. 2/3-1 Cups for ours for an 11 inch x 22 inch tray. The surest way to know what amount of seed to use: Spread dry seed on the bottom of your container so that the seed is spread evenly and sparsely (about 1/16 - 1/8 of an inch of room between seeds is the goal, but don't sweat it, there is no way you can do that even close to exactly - it is just a goal! ).